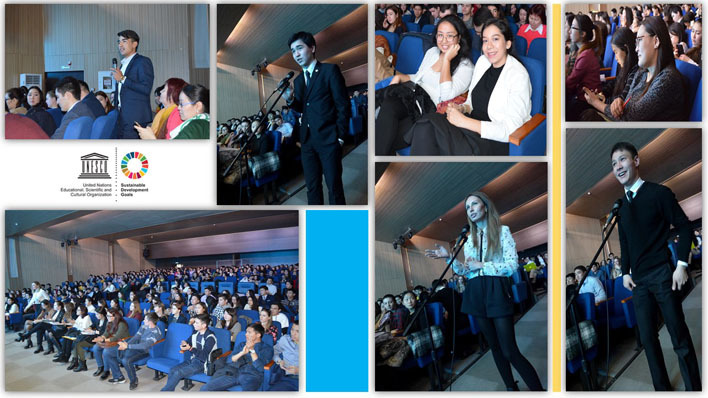 On 17 February 2017, UNESCO Cluster Office in Almaty held in cooperation with the UNHCR with the support of the "TURAN" University and the Office for the Youth Policy of Almaty a three-hours workshop for young leaders to build the capacity and raise information literacy regarding the problem of statelessness in the Central Asia. The event brought together more than 370 young people from Afghanistan, Bangladesh, Hong Kong (China), Kazakhstan, Kyrgyzstan, Russia, Tajikistan, Turkmenistan, Ukraine, Uzbekistan and USA. This event was very interesting and informative. It made me think about many things, including the continuation of the study on this issue. It was also nice to get a personal certificate from the organizers of the workshop. Tsoy Anastassiya, the participant of the workshop, 21 y.o. Today statelessness is a global problem, as more than 10 million people worldwide has no nationality and are unable to exercise their basic human rights. On the territory of the Central Asian countries (Kazakhstan, Uzbekistan, Kyrgyzstan, Turkmenistan and Tajikistan) the number of such citizens has over passed 140,000 people. Young leaders have actively participated in the workshop, asked questions and were highly interested in finding the solutions based on the real-life circumstances and personal examples. After the conference by Ms. Sophie Jambazishvili-Yucer, UNHCR Regional Protection Officer, who has more than 10 years of experience in the issues of statelessness, the participants discussed the pertinence of 1954 Convention Relating to the Status of Stateless Persons and 1961 Convention on the Reduction of Statelessness in the context of the Central Asia. The participants examined the definition of “stateless person” in the national legislation which is not consistent with the definition provided in the 1954 Convention and leads to the situations when persons may remain stateless for many years without having their situation solved. The discussions further concerned obligations in the international human rights law beyond those contained in the 1954 Convention, particularly with respect to guaranteeing a child’s right to a nationality as enshrined in the Convention on the Rights of the Child and the International Covenant on Civil and Political Rights. A survey among young people on the problem of statelessness and its relevance in the Central Asia was conducted during the workshop. It was carried out before and after the conference. The analysis showed that at the completion of the event, more than 85% of respondents were able to clearly answer the questions that have initially caused doubts. "The aim of the workshop was to acquaint young people with a global problem, as well as with the methods of its prevention and elimination, as the youth is the main driving force for positive changes." – underlined Arina Plokhikh, Programme Specialist, Social and Human Sciences of the UNESCO Cluster Office in Almaty in Kazakhstan, Kyrgyzstan, Tajikistan and Uzbekistan.